Husson Dining takes home best wings award. The chefs at Husson Dining Services have a lot on their plate. With almost 80 years of experience between them, sous chefs Shawn Stemp, Nick Andrei and David Schultz, are succeeding in providing high-quality dining to the college community by serving the most nutritious, healthful, quality and sustainable food to their customers. “We strive to be the best. We can match up with any of the hospitality places in the area. We want to give students the best in hospitality, while showing that we aren’t a typical 1970s food institution,” says Schultz. Although feeding 1,100 students can be challenging, Andrei notes that the experience at Husson allows him to have “a lot more creativity” than any restaurant. But this delicious food does not stay in the confines of Husson’s Dickerman Dining Center. Since 2013, the team of sous chefs from Husson Dining Services have competed in a number of local contests in its efforts to reach out to the community. The competitions allow Husson Dining the opportunity to show Bangor-area residents the caliber of their food and experience, give prospective Husson students and parents an idea of the quality of living at the college, and showcase their different dynamic compared to other restaurants. In June, Husson Dining beat out 21 other Bangor-area restaurants and organizations with their “sweet, smoky, hot wing” to win this year’s Wingfest Maine. Schultz credits the team’s “love and commitment for their product” and the years spent perfecting the wing’s sauce to their win. 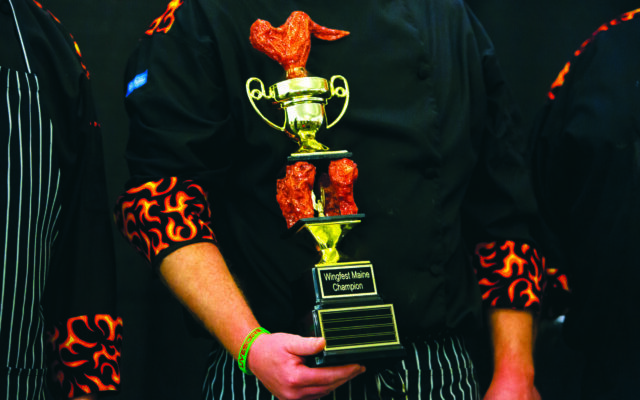 The team made 240 pounds of wings, and drew a 40- to 60-person long line, by the end of the competition. According to Bob Sedgwick, Director of Dining Services at Husson, what made Wingfest so crucial for Husson Dining was the community involvement. Wingfest Maine is not Husson Dining’s first food competition win for 2017. This year, Schultz and Andrei won the Firefighter’s Choice for Professional Chili and Judges Choice for Professional Chowder, respectively, in the Bangor Firefighter’s Chili and Chowder Cook-Off. Schultz earned Judges Choice for Chili in 2013 and 2014, and People’s Choice for Chili in 2015 at the annual cook-off as well. Schutz also won second place at the 2017 R.M. Flagg–EAA International Baked Bean Competition. Stemp and Purdy have also earned individual culinary medals. Whether they compete as a group, individually, or against each other, what draws the chefs to these competitions is not the awards, but being representatives for Husson Dining. The competitions allow the trio to experiment and challenge themselves, making them better chefs and employees in the long-term. As for their key to success? The chefs agree it simply comes down to their passion for food and competitive spirits. “It’s caring about what we do,” says Stemp. As for their next move in the food contest circuit? Sedgwick suggests maybe a dessert competition.